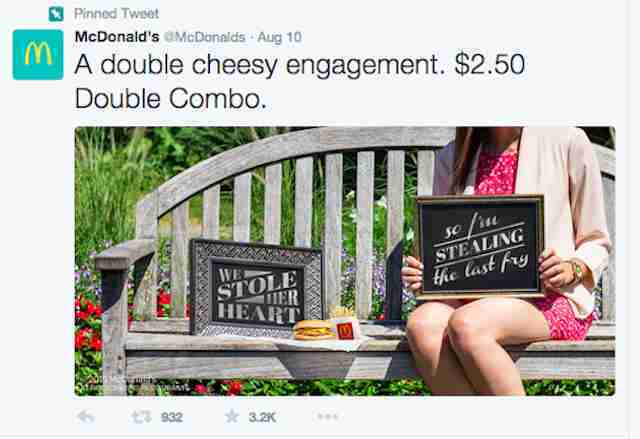 Did McDonald's Steal This Photographer's Burrito Engagement Idea? 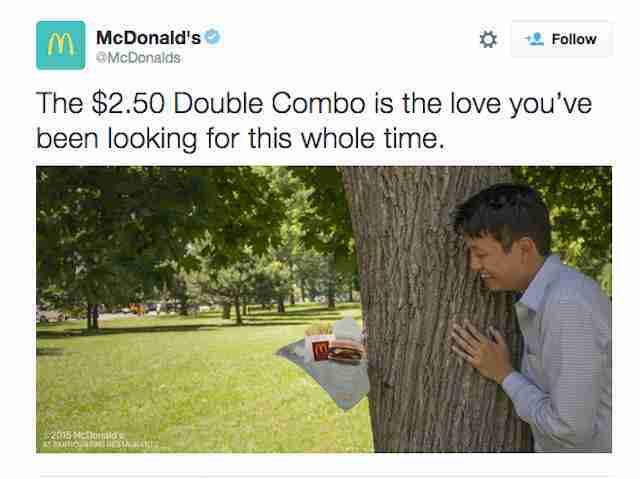 UPDATE: August 21st, 10am -- McDonald's has apparently deleted the tweets featuring the "stolen" images. We've included screenshots below. UPDATE: August 20th, 7pm -- McDonald's has told Thrillist, "This shouldn’t have happened and, with our agency partner, we’re working to find out how it did. We’re reaching out to David Sikorski & Kristina Bakrevski. We apologize to them, their fans and ours." 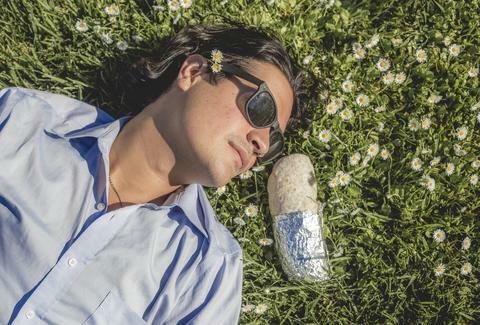 Last month, San Francisco natives Kristina Bakrevski and David Sikorski came up with an idea for an engagement photoshoot between David and a burrito, drawing inspiration from countless engagement shoots flooding their social media feeds. The photos of David gazing lovingly at his burrito fiancé became viral after they were picked up by Buzzfeed. 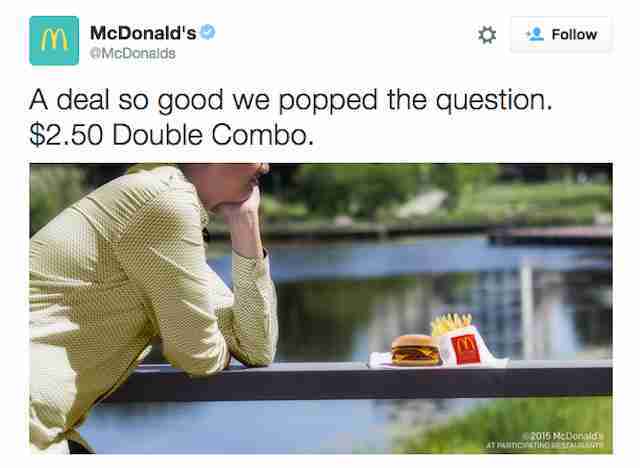 Now, Bakrevski alleges, McDonald's has "hamburgled" her and David's idea for its new $2.50 Double Combo campaign. The ad campaign is definitely engagement-themed (this time, between a man and a $2.50 Double Combo, rather than a burrito), has noticeably similar shots, and even a similar wardrobe on its model (sunglasses and a blue button-down shirt). Via email, Bakrevski told Thrillist, "McDonalds for too long has pillaged the environment for their financial gain, super sized our population, and paid their workers dollar menu wages. Their entire model is a scam on humanity. 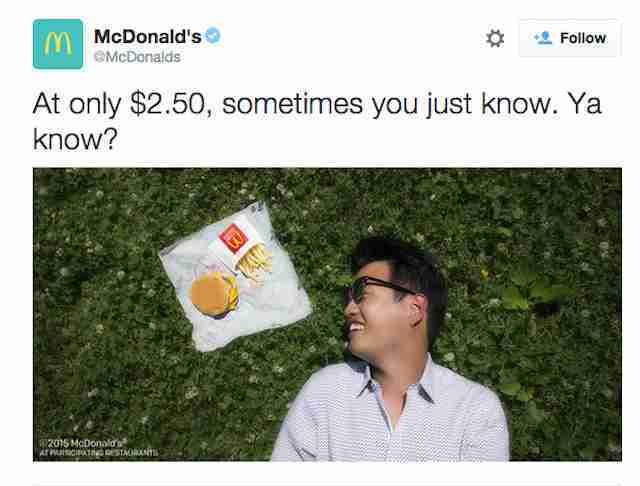 So it's not surprising to me they would rip off our creative idea to sell their garbage hamburgers on Twitter. What's infuriating is that their ad agency probably got paid a lot of money to poorly recreate our concept that went viral a month ago. And they didn't even try to do it better. They hamburglered it down to the wardrobe styling and composition. They just don't care to come up with ideas of their own. And they don't care even more about stealing other artists' work. Shame on them."